← Air Fresheners – In preventing our room from smelling of dogs, are we harming them? A dogs spine – key to a long healthy life? Holistic veterinarian Dr. Peter Dobias in a YouTube video is certain that a healthy spine and back is the key to our dog’s longevity. “Dogs are young as their spine is flexible’. He says neck injuries or back injuries often result in paw licking or forearm licking and it may not be allergy at all”. In this video we will learn which spinal segments are related to which each organ and how to keep your dog mobile, flexible and healthy. Not only can we give our dogs a longer healthy mobile life but we can save money on vet fees too. I have an elderly Labrador and have already ordered the Kong Zoom Groom he’s using. 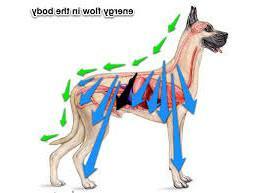 hind feet licking can be caused by tightness in the region of lumbar spine. Tobias believes the spine is essential for the energy flow in the body and certain parts of the spine are connected to certain organs. This video is fascinating as he demonstrates how he does the massage. Here is the story of a Jack Russell I helped a couple of years ago who licked himself obsessively. In the light of what I have now discovered, I shall be revisiting them. There are links to further Paws for Thought on the right. This entry was posted in PAWS for Thought, Science & Health and tagged health, holistic, licking feet, licking forearm, meridians, spine. Bookmark the permalink.